"Station, this is Congressman Hal Rogers with students from Leslie County High School in Kentucky, do you hear me?" asked Congressman Hal Rogers as he opened a live video call to the International Space Station today from the Hazard Community and Technical College's School of Bluegrass and Traditional Music in Hyden. 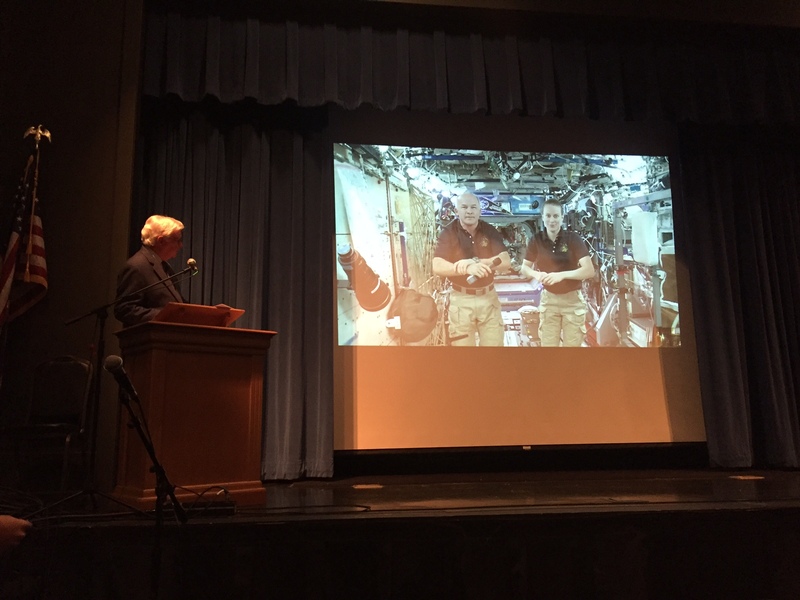 NASA's Expedition 48 Commander Jeff Williams and Flight Engineer Kate Rubins welcomed Congressman Rogers, along with 500 high school students, administrators, community members and leaders from the Hazard Community and Technical College aboard the International Space Station for a live 20-minute interactive video call. "The work that NASA is doing in space has been turned into groundbreaking science back on Earth," said Congressman Rogers. "We need that same spirit of innovation and ingenuity to help us revitalize Eastern Kentucky and inspire the future generation of leaders at Leslie County High School and students all across the region." Congressman Rogers requested the live video call to the International Space Station and a personal visit from Astronaut Tim Kopra to help educate and inspire local students in a coal-producing county that has been devastated by hundreds of layoffs in the coalfields. Leslie County now employs less than 200 coal miners, down from nearly 900 just five years ago, according to the Kentucky Energy and Environment Cabinet. Despite challenges in the local economy, students at Leslie County High School are making impressive strides in state testing scores, earning the school a distinguished rating for the last three years. "How close are we to a propulsion system that will allow interstellar travel?" asked student, Austin Clark. "When you do botanical experiments in space, how do the plants know which way to send their roots with gravity?" asked student, Shaun Baker. "How have you adapted your exercise routines in response to the lack of gravity?" asked Shelby Sparks. The interactive call was broadcast live on NASA TV and on nasa.gov/nasatv where rebroadcasts will be available. Congressman Rogers congratulated Commander Williams for breaking a new record last week for the most days in space for any American, with more than 520 cumulative days. He also wished the crew luck as they prepare for a spacewalk on Thursday, September 1st outside of the International Space Station. 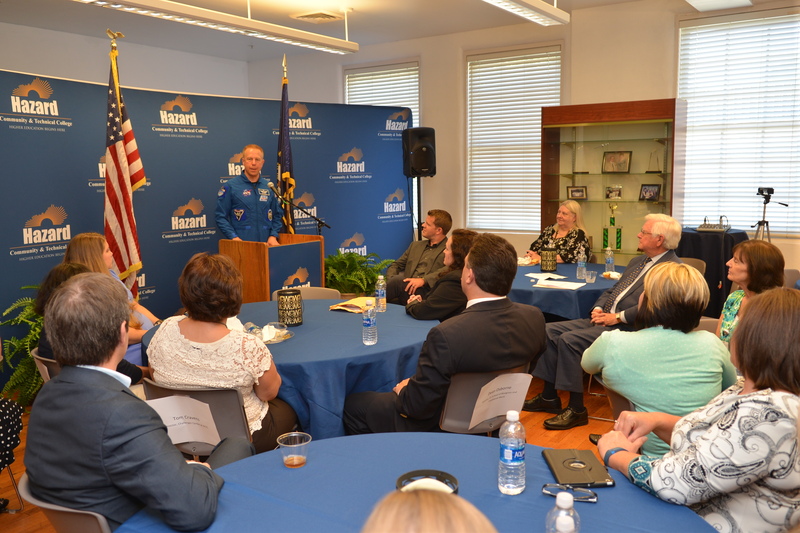 Prior to the live video call, Astronaut Tim Kopra also spoke to students and a joint meeting held by the Hyden-Leslie County Chamber of Commerce and Trail Town initiative. "The first sight of the Earth once you get into space is pretty tremendous thing and maybe even as striking as the Earth is seeing this tremendous space station - larger than a football field, the interior similar to a three or four bedroom home," said Col. Kopra who lived on the International Space Station from December 2015 to June 2016 and worked with British and Russian Astronauts. "In my mind its a shining star of how international relations can work." NASA representatives presented a photo of the International Space Station to Congressman Rogers; Anthony Little, Leslie County Schools Superintendent; and Dr. Jennifer Lindon, President of the Hazard Community and Technical College. Rogers Welcomes to Col. Kopra to Hyden, Ky.